The PT Valve System is a design that allows tire pressure to be monitored with an easy-to-read, liquid filled, dial gauge attached to the valve. PT-Gauge is ordered separately. Comes with gauge and nut. Calibrated 0-160 PSI. The PT valve and gauge can be used on most Large Bore, Super Large and Z-Bore applications. 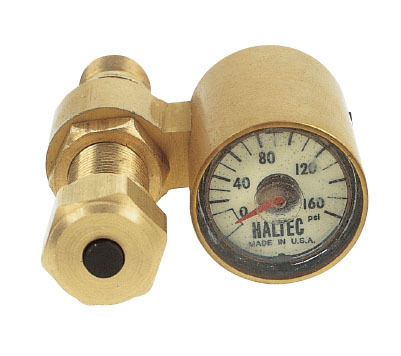 This gauge mounts on specially designed PT-style valves which allow visual tire pressure checks yet also allows for inflation, deflation, and manual pressure checks without removing the gauge. The PT gauge has an all-anodized aluminum body and is completely sealed to prevent moisture from fogging the glow-in-the-dark dial. The PT Gauge is liquid filled to prevent damage from vibration.